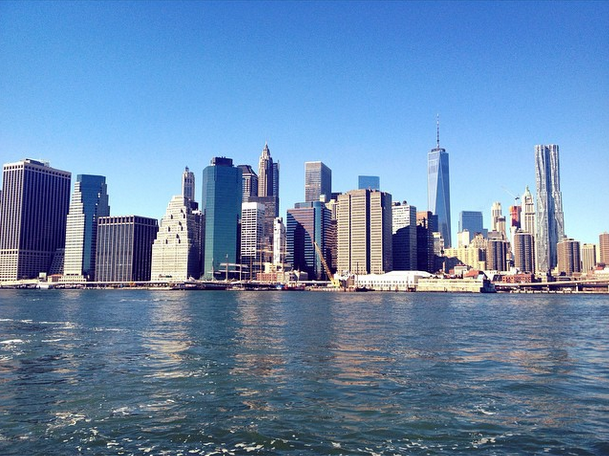 In October I was lucky to go back to the city of all cities – New York for the third time. The last time I was there is more than five years ago, and my family and I felt like it was more than time to go back and visit the amazing city again. The good thing about going back to places you’ve already been to is that you don’t have to spend a lot of time visiting all the important turist atractions because you’ve seen them already. That means you have more time to just stroll around, eat a lot of food and discover and experience hidden gems and take the time to just walk around without having everything planned. That is what we did for a week in New York. The Butchers Daughter. Decorated with an open kitchen, fancy employees, yellow Tolix chairs, wooden tables and a lot of plants this hip café is great for a healthy yet instagram worthy breakfast. 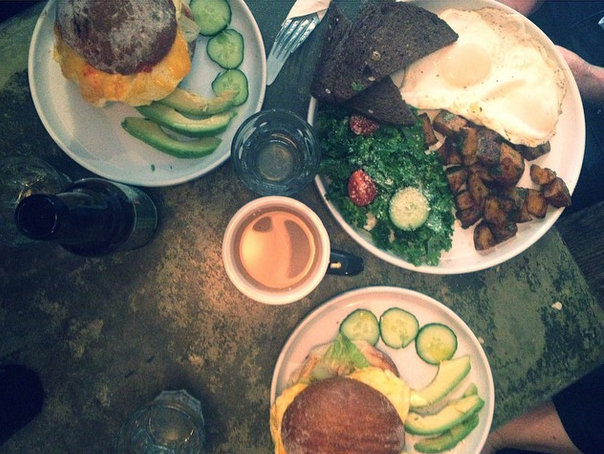 We had egg sandwiches, poached eggs with avocado, watermelon juice and coffee. 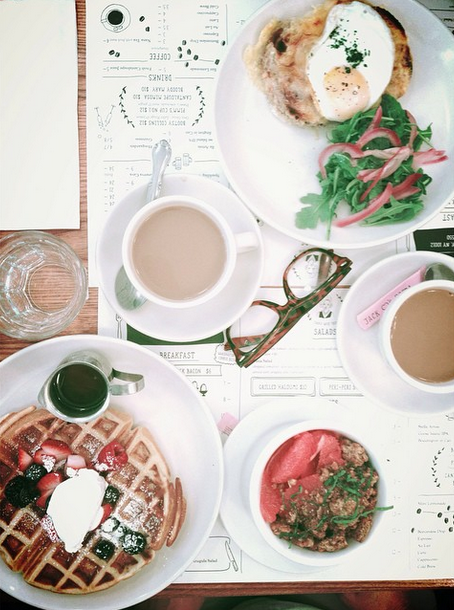 Jack’s Wife Freda – the cutest little hotspot in Soho. 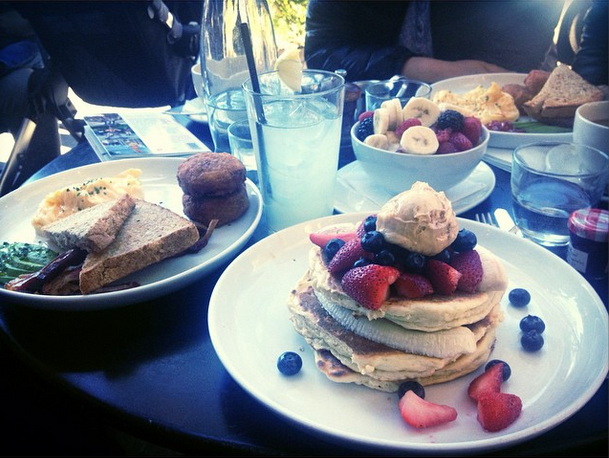 With low ceilings and tight seating the café was packed with breakfast hungry people. 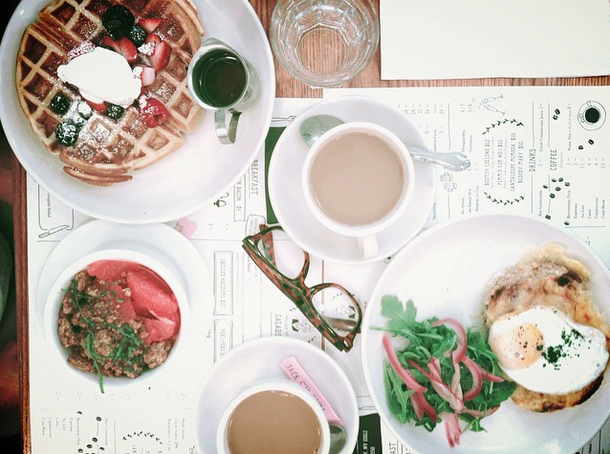 Many of the dishes are israeli inspired but we sticked to the more classic breakfast dishes such as a rosewater waffle with berries, granola with youghurt and grapefruit, eggs and coffee. Oh and there is free refill with the coffee! Five Leaves. This very popular spot in the hippest part of Brooklyn was the deceased actor Heath Leadgers idea and plan. Unfortunately he never got to open up the restaurant himself, but his friends did. 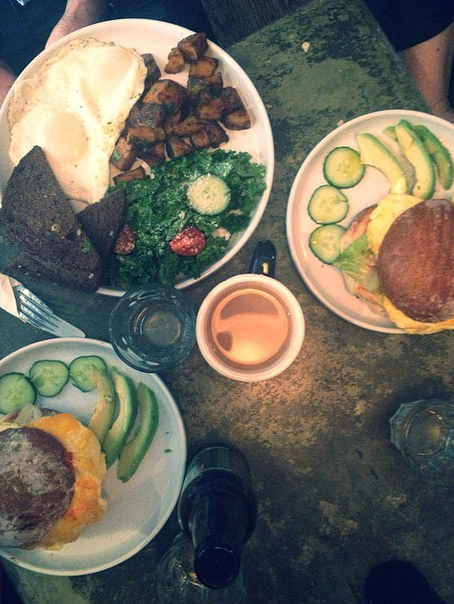 Today Five Leaves is very popular both for brunch, lunch and dinner and their burger is legendary. We went there sunday morning and had to wait an hour for a table. It was so worth it though. The Civil Service Café. This hidden gem we actually found by mistake. It was located close to where we lived, and it is the kind of place I would go with my laptop and hang out all day long if I were so lucky to live in Brooklyn. The decoration was simple yet raw and so was the food. 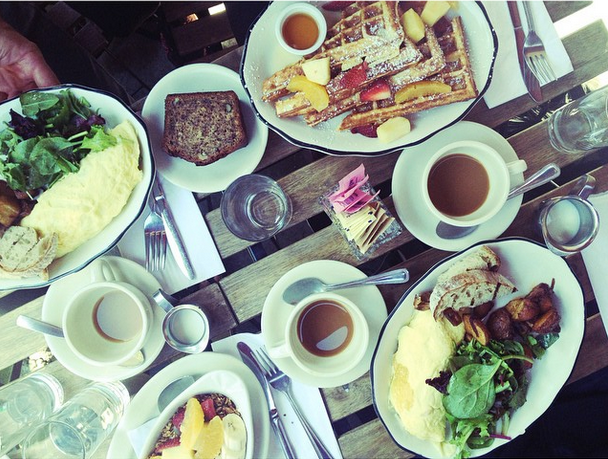 The café serves kale salad, all kinds of eggs, rye bread and a small selection of cakes. In addition to the good and simple food the coffee at The Civil Service Café is really good. 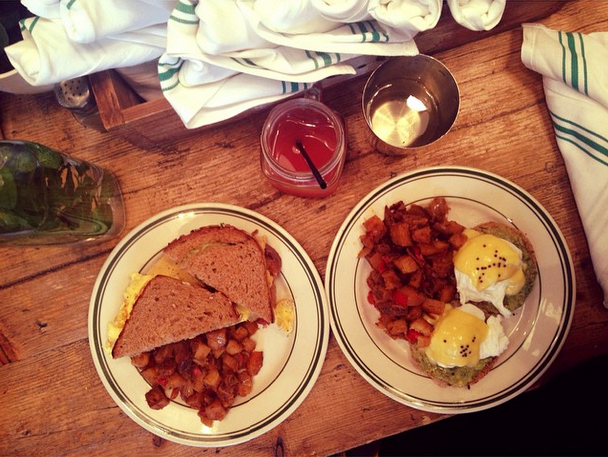 The General Greene – another breakfast café located in Brooklyn. We had our last meal here before going back to Copenhagen, so we were all a bit sad but the food made up for it. 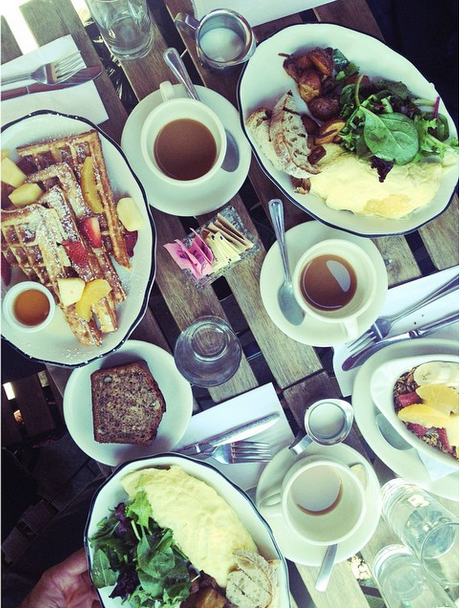 Great granola, great waffles, great eggs and great potates. And european cafés- please learn from the americans and start serving refill coffee! Shake Shack is the name of New York City’s own fast food chain and man – I don’t know what was best – the burger or the peanut butter shake. 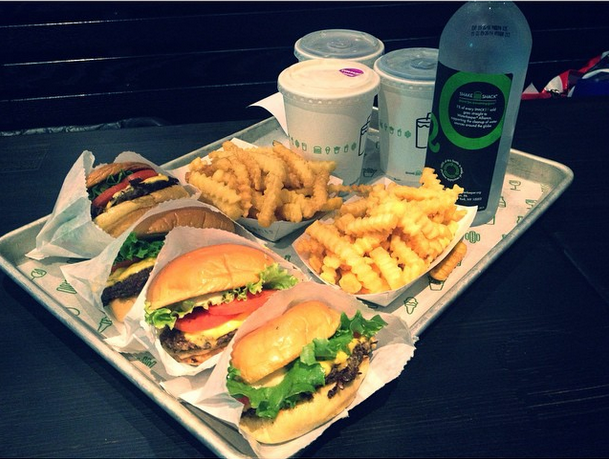 Unlike other fast food burger chains Shake Shack actually uses real salad and tomates and meat in their burgers. Shake Shack is located different places around New York, but I think the location by the Brooklyn Bridge is one of the best places to go to try a Shake Shack burger. Whole Foods Supermarket at Union Square. Whenever I am in The States I always go to Whole Foods. This supermarket is heaven for every food lover that loves healthy food like juices, fruit, vegetables, salads and whatever is the new black in the super food/healthy food scene. 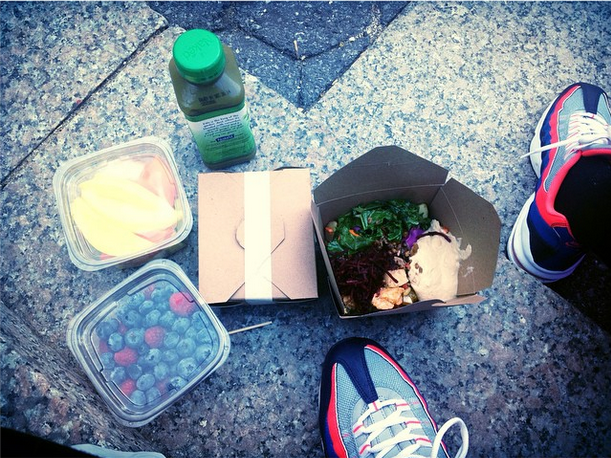 We went to Whole Foods and mixed our own food box from the Whole Food’s buffet and took it outside and sat on some steps on Union Square and had a real New York experience sitting there watching guys play football in the middle of everything, seeing orthodox jewish boys walking to school, and New York people running to catch their subway. 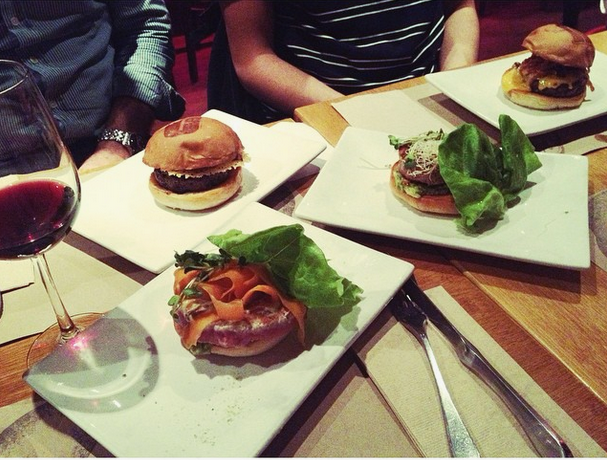 Umami Burger – another great burger place that has different burger variations. I got a tuna burger, my mom got a chicken burger, my dad a cheeseburger and of course my brother got the double cheeseburger. 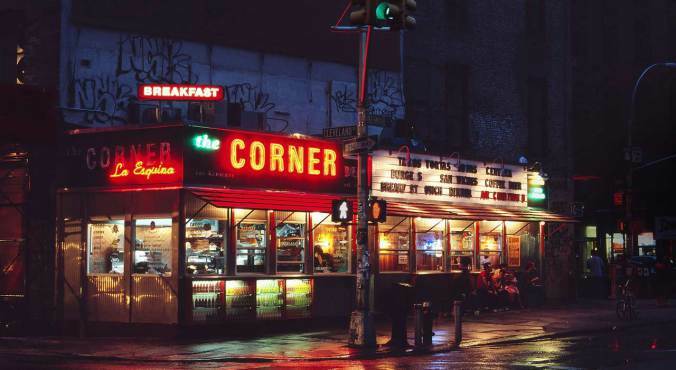 La Esquina – located in an old original diner place you’ll find a real NY hotspot. Everything about this place is cool – the employees, the guests, the decoration, the location… not to talk about the food which is amazing. They do classic mexican dishes and I tried a plate with burritos, chicken, beans, salad and salsa and it was just perfect. Even though we spent most of our time in New York with walking around and eating(!) we also managed to do our part as good tourist. A great experience was to go sailing with the Staten Island Ferry to Staten Island and back. The ferry trip is free and you get the most amazing view of Brooklyn, the bridges, the Manhattan skyline and the Statue of Liberty and it only takes about 25 minutes each way.